Product prices and availability are accurate as of 2019-04-18 19:57:00 EDT and are subject to change. Any price and availability information displayed on http://www.amazon.com/ at the time of purchase will apply to the purchase of this product. The ideal kit for all your light duty welding/brazing needs. This outfit compatible for cutting by adding the TCA-10 cutting attachment. 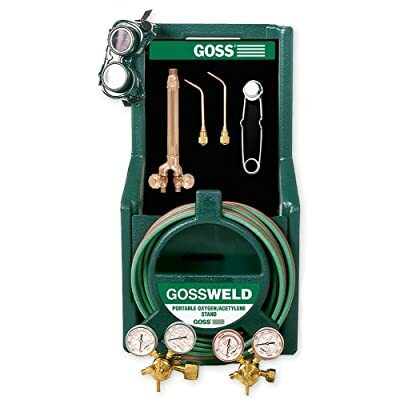 Kit complete with TW-10A torch, 3033-1 welding tip, 3033-3 welding tip, SW-12A hose, MP-35 goggles, MP-1 lighter, EO-25F-A oxy regulator and EA-25-MA fuel regulator or EA-25-BA fuel regulator. Also includes B acet regulator.